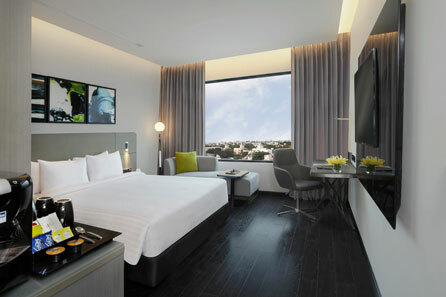 Our design concepts for the new Novotel Chennai (Chamiers Road) were inspired by the rich artistic traditional and contemporary culture of Madras. 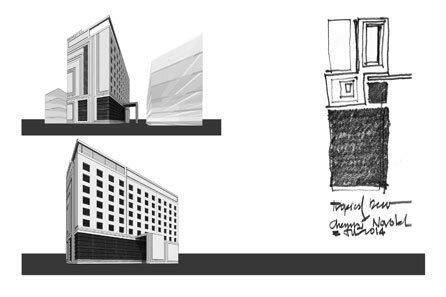 Located in the vibrant city centre and near the Georgetown district, the local vernacular architecture and local arts provided a wealth of inspiration for our designs. The tropical art deco style found in Chennai was a our greatest source of inspiration for both the exterior and interior design. 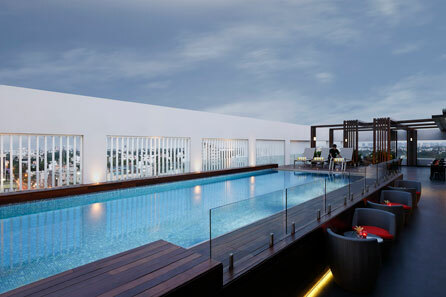 In the early 20th century, the art deco style of architecture arrived in Chennai. 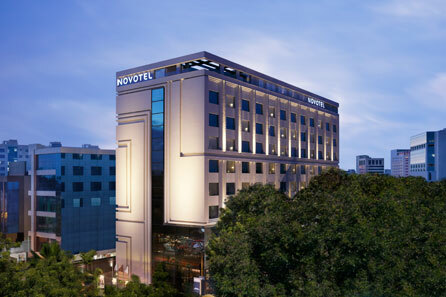 From the 1930s onwards, many buildings in George Town district of Chennai were built in this style and was the inspiration for our Novotel façade design. 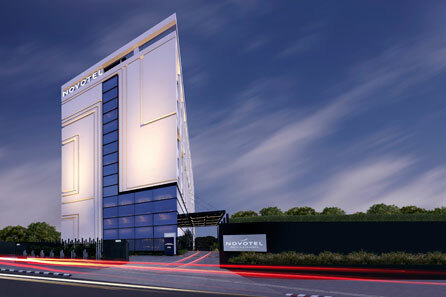 The unique façade design is taken from a frozen video simulation and is constructed of corbelled or stepped precast concrete panels which provides depth and shadow in the tropical sun. 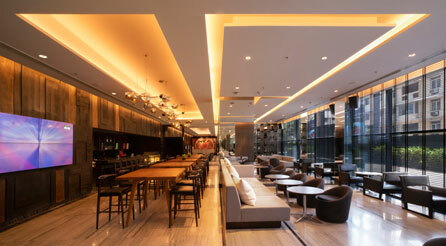 The ground floor lobby and Novotel Gourmet bar are combined as a single space creating a social gathering hub all times of the day, from breakfast to a destination bar in the evenings. 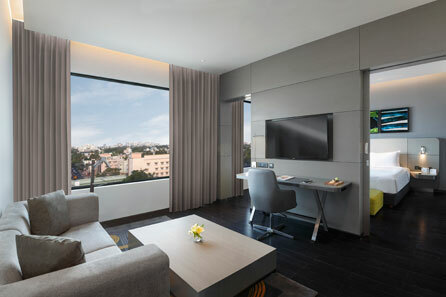 Aesthetically, the design style is inspired by the Madras traditional and contemporary artist culture and the tropical deco style. 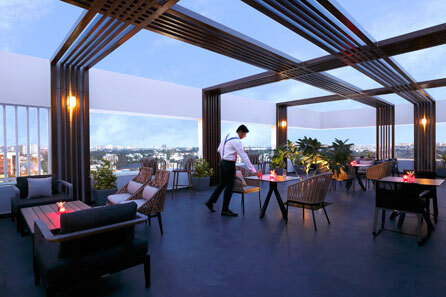 The grand feature wall of blackened rough timber and inspired by the local vernacular architecture of India extends from the lobby to the Gourmet Bar and features vibrantly coloured local contemporary artworks. The stylish tropical deco black, white and neutral grey palette of materials is warm and inviting to guests and visitors. 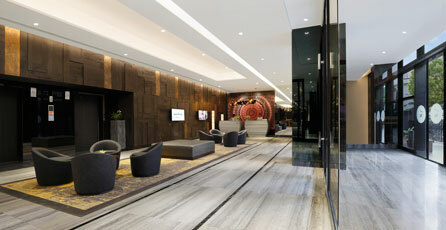 The first floor all day dining is designed as a destination restaurant venue rather than a typical hotel all day dining. 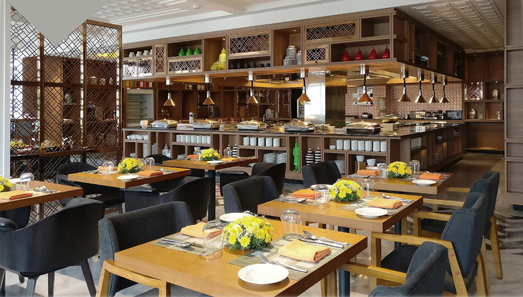 The restaurant is planned with a variety of open café style, flexible partitions and intimate seating options for the breakfast lunch and dinner dining experiences. 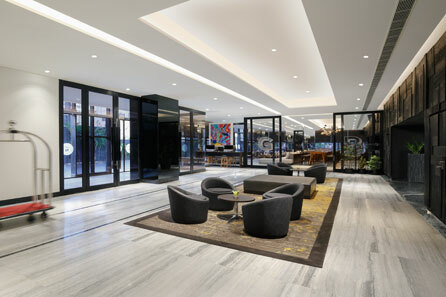 The design style is tropical deco blacks, whites and neutral greys warmed with woods, leather upholstered banquet seating, patterned floor tiles, coffered ceilings and period styled pendant lighting. 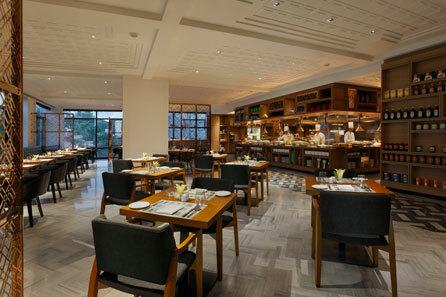 The Food Exchange is designed as a show kitchen with seating and buffet lines creating an interactive dining experience for all dining times. Private Dining rooms offer space for meetings and intimate private dinners. 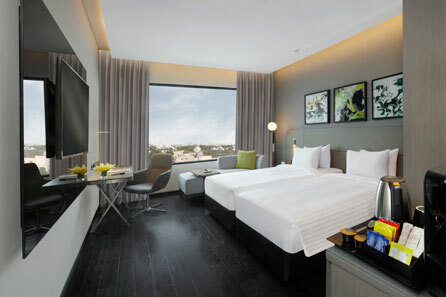 The guest rooms are designed in a contemporary, deco style with a black, white and neutral grey colour palette accented with red and orange fabrics and contemporary artworks. The colonial slatted wood shuttered wardrobe and sliding partitions add a traditional elegance and enhance the room spaciousness providing natural light and warmth to the guest bath.